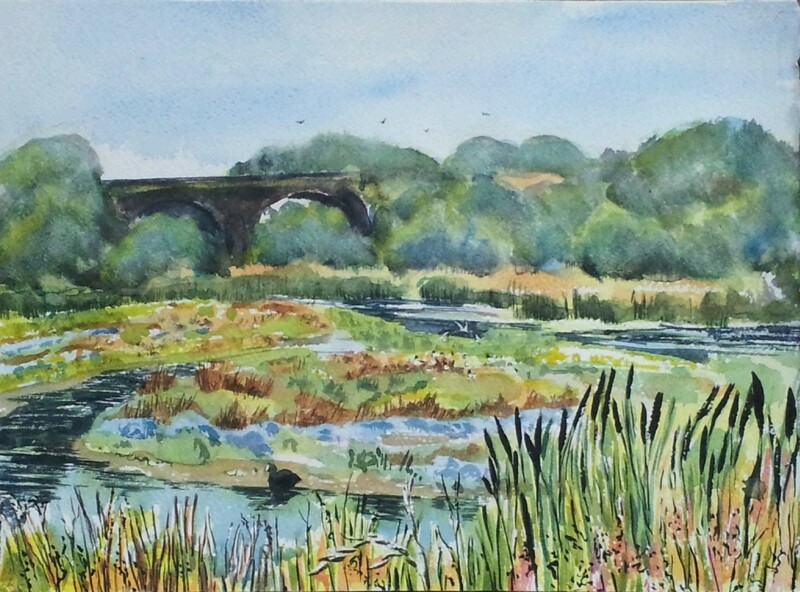 This was painted on a piece of Arches rough paper on the same day as I had sketched the heron lurking in the distant reeds. 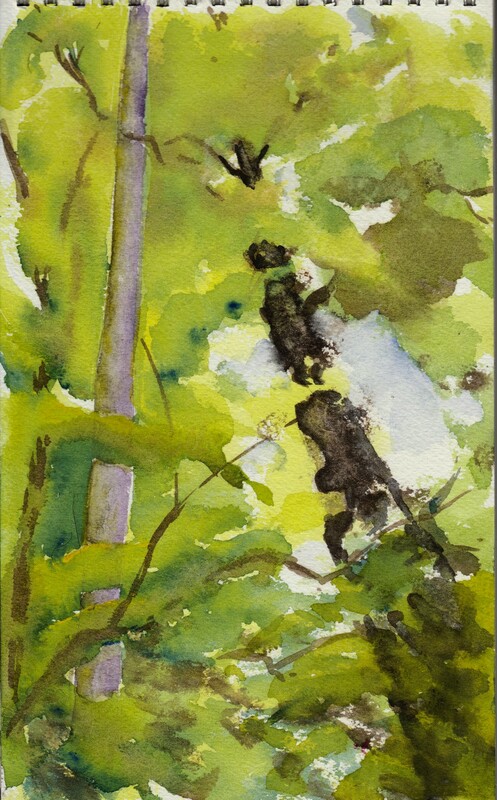 Once again this was an exploration in mixing greens, mainly using cobalt and aurolean. 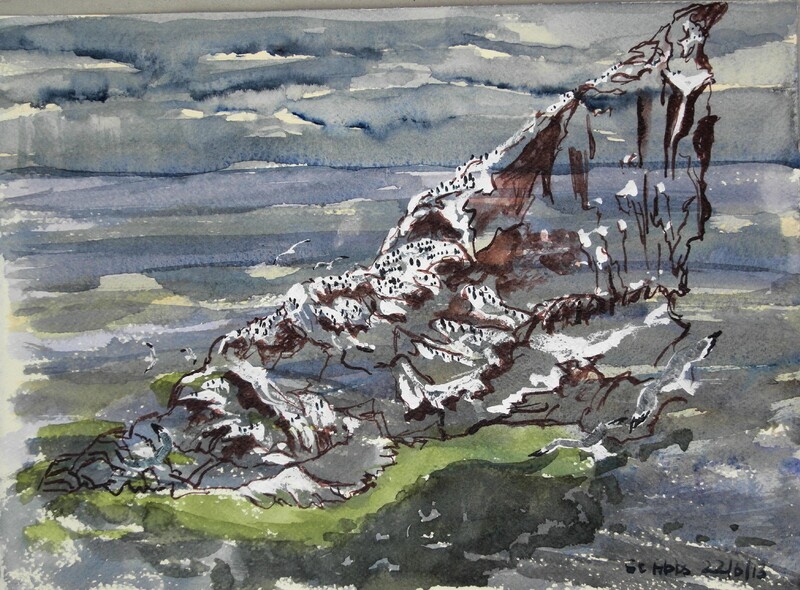 The slide show shows the field sketch with the same tonal values throughout fore, mid and background. This week I reworked this, first building in deep contrasting darks using the colours I had already used but now mixed with paynes grey (cool) or neutral tint (warm). The background was now far too dark. I lifted the colour and softened the lines before reapplying wet and dilute washes of the blue and yellow separately. I think those trees have receded as a result. Careless blots became flying birds above the bridge. 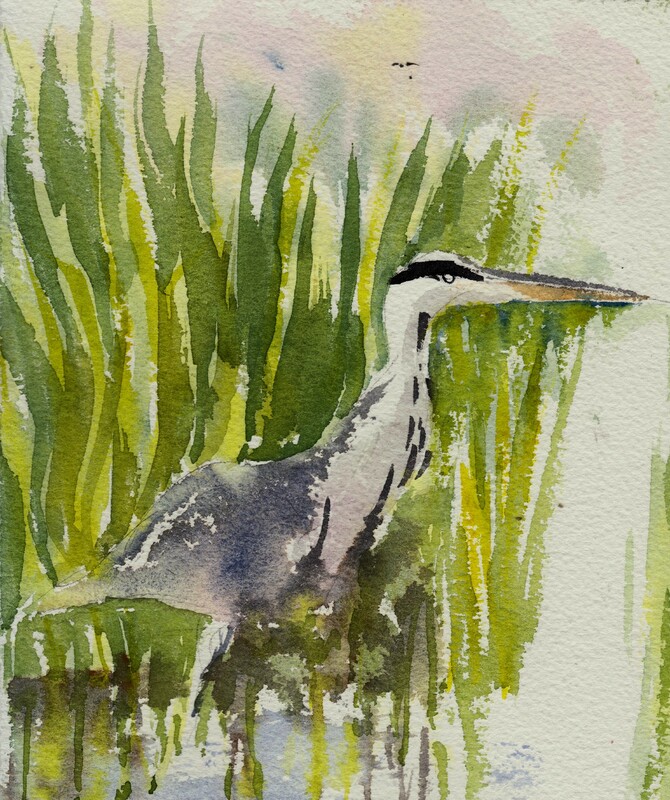 Herons are ambush predators. I watched this one stalk the side of flooded quarry, wading out looking for fish, disappearing into the reeds hunting for nestlings and frogs. The threat was recognised. A pair of common terns mobbed it as it hunted. 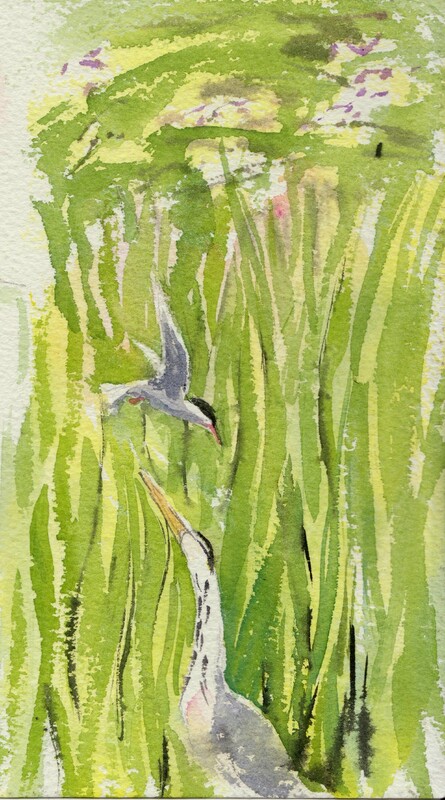 These quick sketches were more about the vegetation than the bird (with its unnaturally long bill!). I sought to contrast the cool neutrals of the predator (ultramarine, burnt sienna and rose madder) with the cool greens of cobalt blue and aurolean. I still need to find those deep dark cool contrasting greens to define the foliage. I rarely meet another person in the small woodland behind the flooded quarry works. 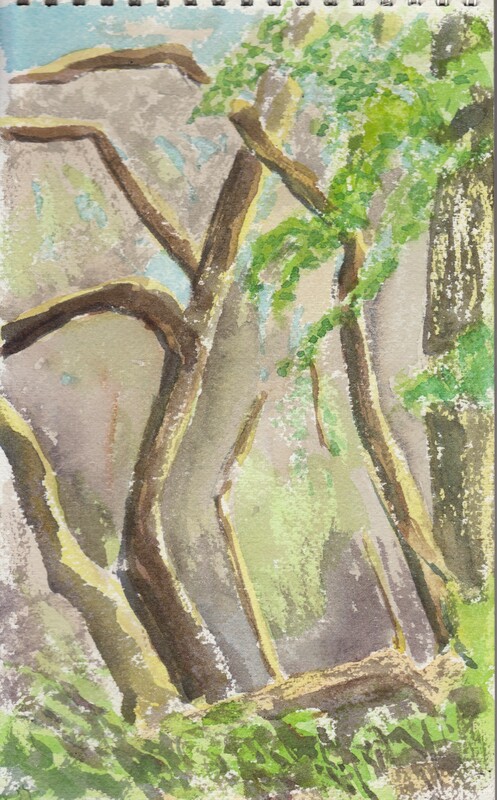 It is a perfect place to practice my skills painting the light filtering through foliage. Wheeling my bike, I stumbled across a man camouflaged by the path, crouching with tripod and camera. He was setting up a shot of a fox “that always crosses here late afternoon” as it moves out into the open fields bordering the wood. I quickly moved on, out of his way. I came back by another path, outside the wood, to avoid disturbing him. But to no avail, I glimpsed him through the trees, packing up and leaving disappointed. Then I realised my pad had fallen from my bike. I retraced my steps. When I finally got back, there was the fox, walking through the woods, across my path and disappearing into the crops in the field. 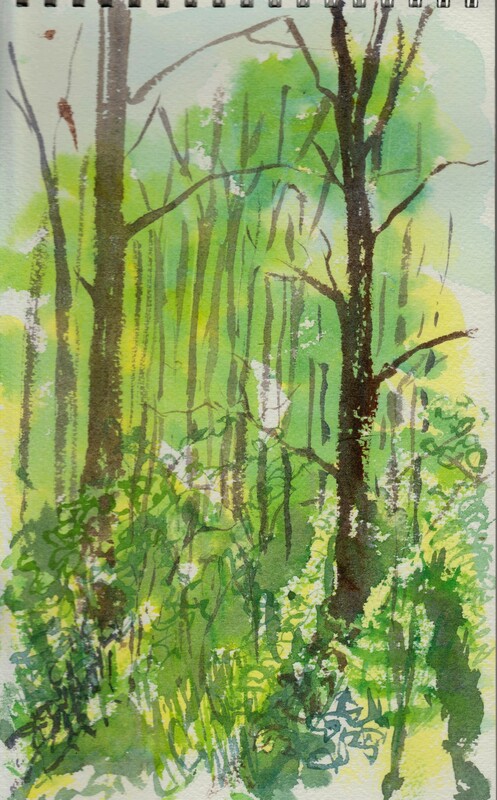 These two sketches were done within a couple of weeks of each other at the end of June, early July, with bright sun making shining yellow greens contrast with deep shadows. After advice on the course in June, I had abandoned phthalo blue and was mixing greens mainly with cobalt blue. 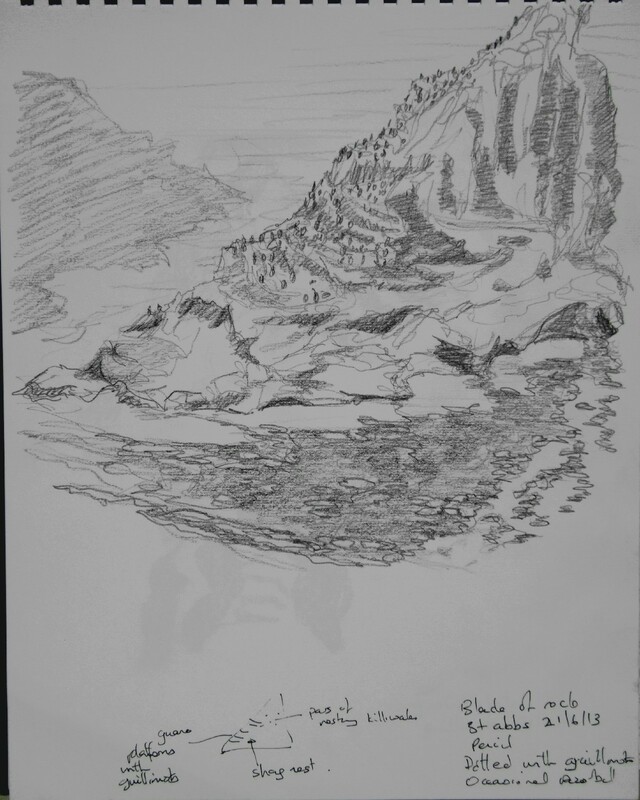 Phthalo plus aurolean makes a viridian which while interesting, overwhelms the picture. Aurolean and cobalt blue makes a range of interesting tones that merge into rich or subdued neutrals with burnt sienna or rose madder. What I am missing is the contrasting darks. 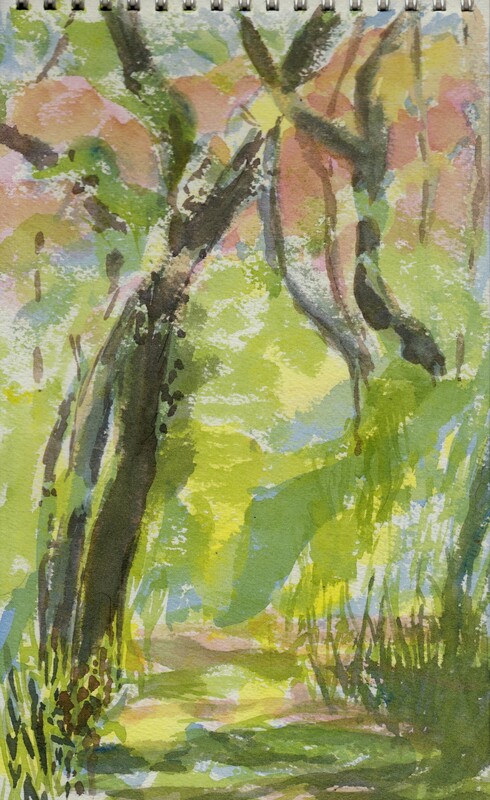 In other people’s watercolours, woodland light and foliage looks deceptively simple. In this sequence, I am struggling with it. The greens are built from phthalo blue and aurolean, the neutrals from variously rose madder, burnt sienna and ultramarine. 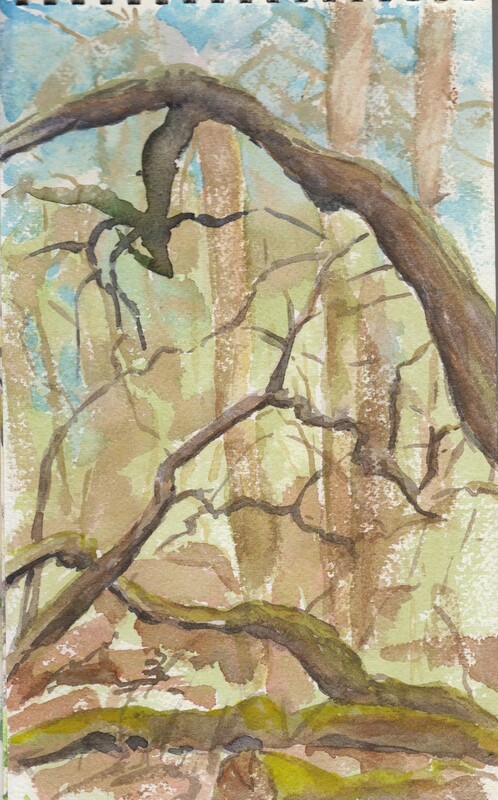 These next half dozen posts show small sketches in an Arches Carnet de Voyage pad from the nearby woods and flooded quarry works made in March, May and July. In the middle of this sequence comes some discussion on mixing greens based on advice given to me during the Seabird Painting Course. 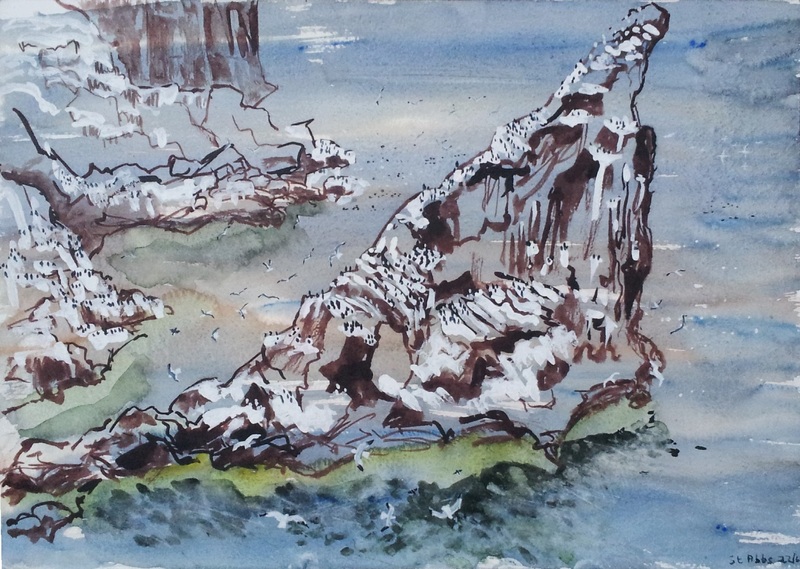 I had one more day at St Abbs. The evening before, I planned an experiment. 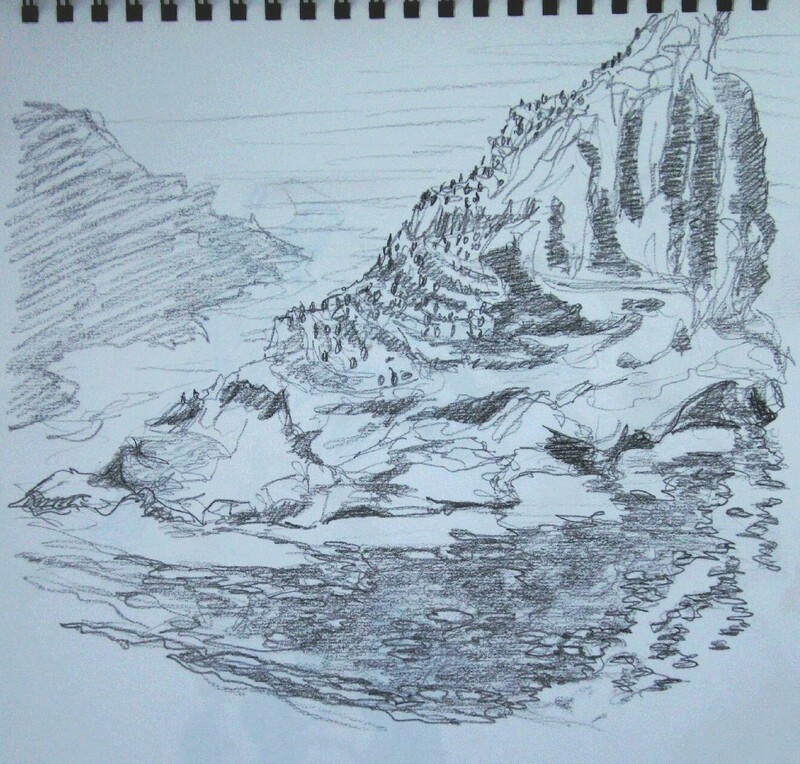 I would cover the paper in a simple wash and build in the shape of the jutting rock simply using white and sepia ink for the guano and shadows and teeming birds in the air and dotted on the sea. The rest would be left with the wash showing through. As the rock became submerged, it took a muted golden hue as shown. I photographed this on site (lower image) before the next drastic step of putting in the shadow and reflection (upper image). I think this deeper tone was needed to ground the rock but on reflection it should have been done more delicately. I unintentionally obscured the fractal line made by the yellow spreading into the blue wash.
For completeness, this was my first attempt. 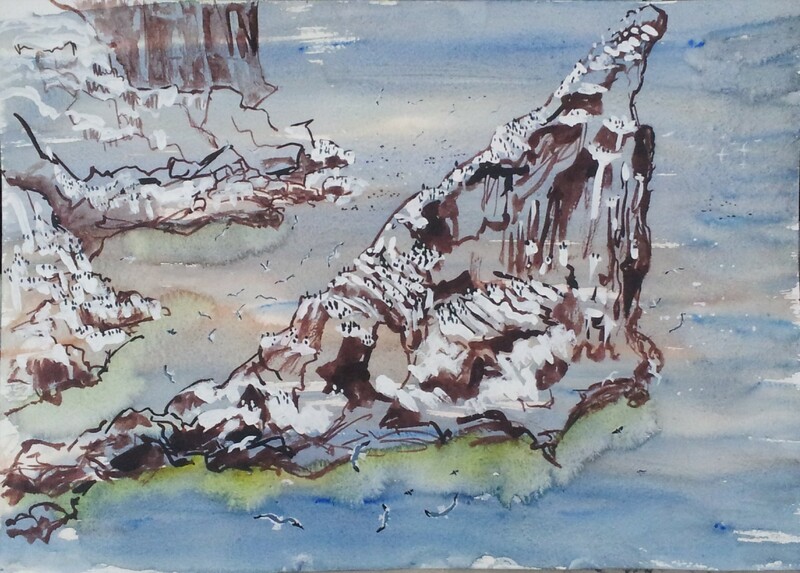 Viewed from the cliff tops, this triangle of rock seemed to project at right angles and be suspended over the sea. From the side it was like the marker on a sundial. This was the roosting site for the various birds shown in the previous post.